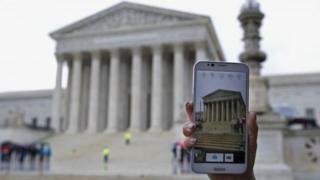 The US Supreme Court has ruled police cannot search the digital contents of mobile phones of those arrested without a warrant. The unanimous decision is a win for privacy advocates that argued searching mobiles was an unreasonable intrusion. Chief Justice John Roberts wrote in his opinion that mobiles "hold for many Americans the privacies of life". The high court had weighed appeals by two people convicted based on evidence found on their phones. Both were convicted of crimes for which they were not initially arrested. Under the fourth amendment to the US constitution, police and other government officials generally need to obtain a warrant from a judge before they can conduct a search. A warrant requires evidence that a crime has been committed by the suspect. Justice Roberts wrote in his ruling for the court that constitutional protection applied to the contents of mobiles, as they "differ in both a quantitative and qualitative sense from other objects that might be carried on an arrestee's person". "Modern cell phones are not just another technological convenience. With all they contain and all they may reveal, they hold for many Americans the privacies of life,'' he wrote. "Our answer to the question of what police must do before searching a cell phone seized incident to an arrest is accordingly simple - get a warrant." More than 90% of Americans own at least one mobile, according to the Pew Research Center. More than 12 million people were arrested in the US in 2012, according to FBI statistics. The Supreme Court had previously ruled that during an arrest, police do not need a warrant to empty a suspect's pockets and examine whatever they find in order to ensure officers' safety and prevent the destruction of evidence. But Wednesday's decision rules the contents of mobiles do not fall under that rationale. The case came to the US high court through two separate appeals. In the first, prosecutors used video and photographs found on David Riley's smartphone to persuade a jury to convict him of attempted murder and other charges. Riley had been driving on a suspended licence, and police found guns in his car and charged him with carrying a concealed weapon, then searched his phone. In the second case, Brima Wurie was arrested on suspicion of selling crack cocaine. On grounds of "officer safety" police examined the call log on his mobile phone and used that information to determine where he lived. When they searched that residence, with a warrant, they found crack cocaine, marijuana, a gun and ammunition.